Idle No More is a movement of indigenous people in North America that, among other things, has taken on the issue of sports mascoting. Here Dave speaks to two Idle No More members about this aspect of their work. Idle No More is an indigenous persons– or First Nations–led movement that has had an electric effect on indigenous activism throughout North America. Emerging into public consciousness in Canada in December 2012, Idle No More has become a touchstone for a host of indigenous-led movements ranging from economic and ecological justice to the battle to stop the mascoting of First Nation’s people. I interviewed Idle No More members Alexandria Wilson and Erica Lee about their thoughts on mascoting and why they see it as a connected part of their struggle. Dr. Alexandria Wilson is a Cree and the professor and director of the Aboriginal Education Research Center at the University of Saskatchewan. Erica Lee, who is also Cree, is an undergraduate philosophy student at the University of Saskatchewan. Ms. Lee recently led a successful movement to change the name and logo of her high school team, the Bedford Road Redmen, in Saskatoon, Canada. Dave Zirin: Alex, people who want to keep names like Redmen, Redskins, Indians, Braves—like Dan Snyder, owner of the Washington football team—often say, “There are bigger problems in indigenous communities than mascoting. Focus on the real problems and not on sporting events.” How do you respond to that? Dr. Alexandria Wilson: My response is that all of these things are connected, so when people try to minimize the overall impact of racist caricatures and mascots, what they’re doing is erasing the true history of what happened to indigenous people—not just in North America, but elsewhere in the world as well. Erica, can you talk about the movement to get the Bedford Road Redmen to change their name? Erica Lee: I’ve been working on this for the past two and a half to three years now. And before that, when I was a student at Bedford Road, in high school, I was working on it. But I definitely didn’t have the courage or the support structure to be able to change it at that point. We had a good foundation, because back in the 1990s there was a group of First Nations people who tried to change the logo but they felt overwhelmed and couldn’t continue the fight. So, what it is about to me is just continuing, being persistent, showing that we’re not going to go away on this, that we’re not going to forget, that we’ll still stand. I think the folks who are fighting the Washington team name are doing a great job on that. Erica, What’s the connection between Idle No More—and perhaps you can tell us a bit about what Idle No More is—and what you were able to do at Bedford Road? EL: Sure, Idle No More is a movement that started here in Canada. And it’s about a fight that started against a few bills that were laid down by the Canadian government which limit the rights and the sovereignty of First Nation’s people in Canada, and do a lot of environmental damage as well. So we started Idle No More to get discussion going and to get resistance going on issues that effect indigenous people. Mascots—like Redmen, like the Washington team—are issues that effect indigenous people. Like [Alex] said, it’s not just a small thing on the side, it’s all part of a bigger narrative. Alex, let’s bring it back to DC. The latest gambit by the owner of the team, Dan Snyder, was to start something called the Washington Redskins Original Americans Foundation, a charitable foundation. I was just curious, what was your reaction when you heard that this was going to be his response to all of the criticism that he’s been receiving? AW: I thought that it was kind of juvenile, and once again a way to commercialize our identities. And, honestly, it’s quite ridiculous. And so, rather than making a change that would have some sort of social impact, he’s trying to buy people’s votes, buy people’s public opinion. I think, from a marketing perspective, if he really wants to make money out of this, he could merchandise a new logo and there would be a whole new commercialized aspect. But I think that this is all in line with people who want to erase our stories, and actually just want to erase the visibility of indigenous people in North America. EL: I think people forget too is that it’s just recently that this issue has received prominence, but the reality is that we’ve been fighting these things for decades, so it’s not something new. The resistance has always been around, and it’s powerful to know that we now can finally start to make a difference with our voices. AW: I’d like to add to that too. Suzan Shown Harjo was in a class action suit against the team back in the ‘80s and ‘90s, so like Erica said, there’s been resistance going not for just five, ten, twenty years, but hundreds of years on addressing racism towards indigenous peoples. And so, I think one of the significant things that has happened lately is the Idle No More movement, but also its connection to social media. So now we’re able to share information quickly—articles, teach-ins, educational materials that help people understand to put the mascot issue into the larger context of racism. Not only racism, but also sexism and misogyny and hypermasculinity and homophobia and how those are linked too. And I think that’s a really important issue for sports fans, commentators and cultural critics to take into consideration. Alex, You mentioned misogyny and hypermasculinity. When you speak to indigenous people and you speak about issues of mascoting, do you find it to break on gender lines at all? AW: I do find in our own indigenous communities, of course the impact of colonization has been internalized, so there is sexism throughout our whole community. That is something that we have to address. And Erica, when you were working around the high school name, who were the people who sided with you and who didn’t side with you? What alliances were there? EL: I remember the first time I ever started complaining about this mascot or raising the issue was in high school, grade eleven. And there wasn’t too much backlash from my peers at the time, but actually teachers who really defended the logo and said, “It’s an honor. You should be honored, this is your culture.” And that’s why I backed off, I thought, “Oh, this is an authority figure telling me, then I must be wrong.” And that’s why it’s so frustrating to see so many teachers and educators reinforcing these stereotypes in the minds of young First Nations kids, and students in general at that school and all around the city. It’s the job of educators to encourage critical thought, not to tell them to blindly follow stereotypes of First Nations people. These have real consequences and effects on our everyday lives. Last question. 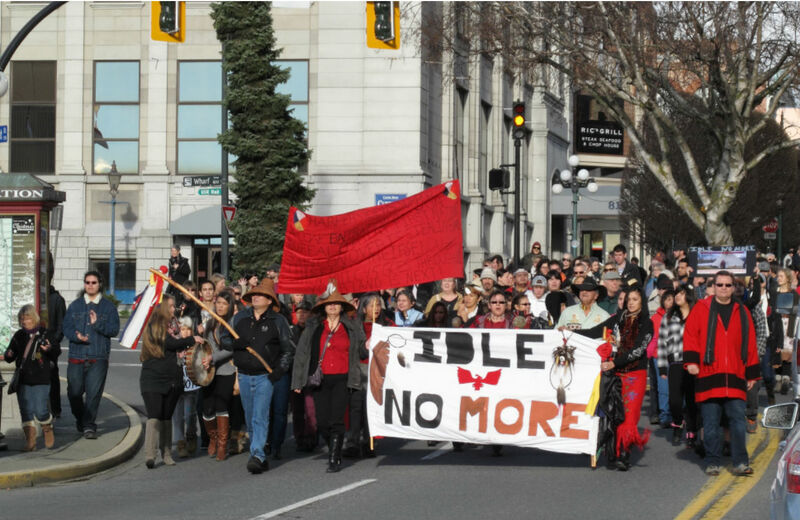 How can people find out more about Idle No More? AW: Well we have a website, idlenomore.com or idlenomore.ca. And people can visit that website, and then there are about four hundred and some Facebook pages… So if people just Google ‘Idle No More,’ and there are different regional groups as well. That’s probably the best way to find out information.